Intuitive software to design the perfect shoe last. 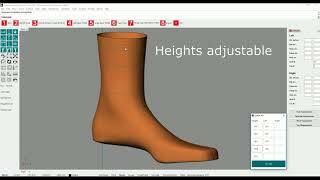 With our unique design method, you can use any part of your 3D scan and any part of your shoe last template. You can also only use a toe model and the rest of the 3D scan. Anything is possible and completely What You See Is What You Get. Not a CAD expert? No problem, by dragging bars in the beginners mode everyone can design shoe lasts. If you are more used to designing, you can go to expert mode and have 100% control with your shoe last. 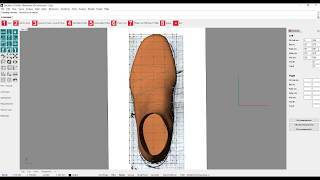 After you digitize your shoe lasts, import them into the LutraCAD template library for your future shoe last design. Or modify shoe lasts from our existing library and change them as desired. 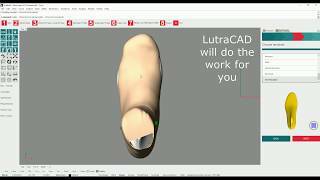 Get guided by LutraCAD's unique step-by-step user interface. We simplify your process by automatically defining measurements and real-time updating them as you modify the shoe last. Easily design your shoe lasts. After you merge your 3D scan with the templates. It is possible to smooth out the last, mark bones and add or remove material.